When you blink, your eyelids push tears across the eyes to keep them moist and healthy. Blinking also pumps your old tears into the tear duct, which acts as a drain to remove excess fluid from your eye. Your tear duct works in a manner similar to the drain in a sink. If the drain of a sink becomes blocked, the fluid is not able to flow out and begins to accumulate. With your eye, if the tear duct becomes blocked, the excess tears build up and remain on your eyelid. In severe cases the tears spill over the eyelids as if you were crying. The excess tears in your eye often cause redness, irritation, and blurred vision. Because the tears are stagnant, they may become infected. The tear duct consists of two small openings called puncta, one in the upper eyelid, and the other in the lower eyelid. Each of these openings leads to a small tube which empties into the lacrimal sac between the inside corner of the eye and the nose. 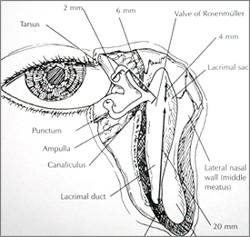 The lacrimal sac leads to the nasolacrimal duct, which passes through a bony opening into the nose and empties tears into your nasal cavity. Your surgeon may recommend a number of treatments based on your symptoms. In some cases treatment may be as simple as applying warm compresses and antibiotic drops. However, surgery is often the most effective treatment. The most common surgical solution can be performed in the office under local anesthesia. Sometimes the tear duct becomes blocked near its opening into the eyelid. When this happens it can be opened with very fine instruments. It takes only a few minutes to open the tear duct with microsurgical scissors. 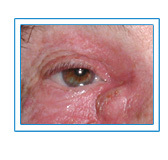 In other cases the blockage is far away from the eyelid and deep within tear duct near the nose. In this instance, surgery under intravenous sedation or general anesthesia, at the hospital or surgical center, is necessary. A new tear duct needs to be created from the blocked sac directly into the nose to bypass the obstruction. A small incision is made along the lower eyelid and a fine, soft silicone stent is inserted into the new tear drain, which keeps the duct open while the healing occurs. The incision tends to heal well and the scar is usually not noticeable. In addition to the removal of sutures, minor bruising and swelling is expected and will likely go away in one to two weeks. Bleeding and infection are potential risks with any surgery but they are very uncommon. Dr. Brazzo has performed thousands of tear duct surgeries and has recently published one of the few textbooks written on this topic. As a recognized New York City oculoplastic surgery provider, he frequently lectures to other doctors around the country on the latest techniques in tear duct improvement. Most patients experience resolution of their tearing and discharged once surgery is completed with little if any postoperative discomfort. The success rate is approximately 80-90% and results are usually noticed within a few days. Dr. Brazzo provides a range of cosmetic and reconstructive procedures for treatment of the eyes, including New York City ptosis treatment and eyelid surgery.. His extensive training allows him to prescribe Latisse and administer facial fillers and Botox in New York.